Ever since Wrestlemania III, when the WWF jammed 80,000 plus (93,000 plus if you believe the WWF’s account that included the staff working the event) into the Pontiac Silverdome…Vince McMahon was seemingly obsessed to top his greatest achievement. He decided to book the former site of the 1984 Olympic games…The Los Angeles Memorial Coliseum for Wrestlemania VII. Vince was heavily hyping his next idea and was boasting an attendance of 100,000 plus. Seeing how he had success filling up the Silverdome and the Toronto Skydome for Wrestlemania’s….many fans and critics were hesitant to doubt Vince couldn’t do it again. 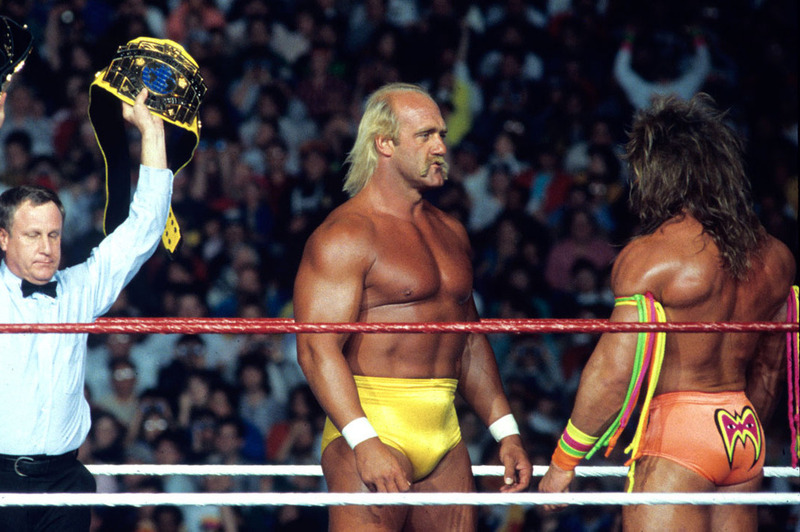 That’s right…”The Ultimate Rematch” from Wrestlemania VI between current champion…The Ultimate Warrior defending against challenger….Hulk Hogan. A year to build it up…It seemed like a flawless plan…so what happened??? Simply put, Vince McMahon’s relationship with the Ultimate Warrior began to sour. Vince started to feel that Warrior was a huge let down as WWF champion. He just wasn’t as marketable as Hulk Hogan had been for so many years prior. I’m sure The Ultimate Warrior’s oftentimes erratic behavior didn’t help matters, so when Vince saw an opportunity to take the strap off the Warrior…he pounced. Enter…Sgt. Slaughter….The Sarge, who was an American wrestling Icon for years….even made an honorary “GI Joe”…came from the dying AWA. Luckily for Vince, the Gulf War was happening and everybody in the United States felt a great amount of patriotism. So what better way to capitalize on that patriotism than turn Sgt. 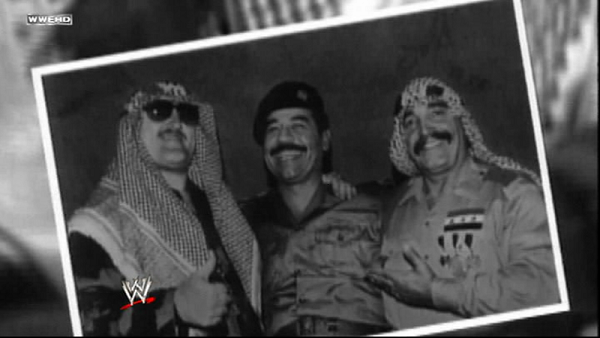 Slaughter into an Iraqi sympathizer and make him WWF champion! It seemed like a smart move…if Slaughter wasn’t at the tail end of his wrestling career. Vince McMahon also got blasted from mainstream critics for trying to capitalize on a real War. That certainly couldn’t be best for business. Alright, so the main event wasn’t going to be as great as originally planned….there still was the undercard to make up for it…..right??? One match that was actually advertised to take place at Wrestlemania VII was the debuting Undertaker facing Tugboat. But wait….wasn’t Undertaker’s first ‘Mania opponent Jimmy Snuka? Yes…perhaps they feared the much bigger Tugboat wouldn’t be able to sell Undertaker’s moves? Who knows for sure? What we do know is Snuka was in and Tugboat was out of Wrestlemania VII. The card wasn’t really shaping up as Vince and company had planned….but all 100,000 fans packed into the Los Angeles Coliseum would certainly make up for a weak card right???…. Okay, so maybe Vince wasn’t going to get exactly 100,000 fans for Wrestlemania VII…maybe a little less than that….maybe about 16,000 fans….tops! How would that look on TV? It may look like an AWA stadium show when fans decided to not show up…making the AWA look weak. Vince wasn’t going to have any of that! So terrorists were being blamed…Yes apparently either bomb threats were made at the coliseum or some crazed sniper wanted Sgt Slaughter dead….OR perhaps 16,000 fans was just the right number to move the event indoors to the nearby arena. Ding Ding Ding! This entry was posted in WrestleMania, WWF and tagged Demolition v Legion of Doom, Hulk Hogan v Ultimate Warrior, Jimmy Snuka, The Undertaker, Ultimate Warrior, WrestleMania, Wrestlemania 7, WWF. Bookmark the permalink. That was a nice moment. How do you know that Hogan vs. Warrior II was the intended main event of Wrestlemania 7?